“Elseworlds” concluded its three-night event on Supergirl, which shifted from a body swap story to a total rewriting of Earth-1 guest starring some Earth-38 characters. As John Deegan was busy fashioning himself into a more selfish version of Superman, Oliver (Stephen Amell) and Barry (Grant Gustin) had to use their newfound criminal connections to find restore the universe. And as for Kara (Melissa Benoist)? She had to convince a different Alex Danvers (Chyler Leigh) to set her free and let her become part of the plot. Scenery chewing has never looked so good. There were several things to take issue with in “Elseworlds,” most notably that it didn’t have as much Supergirl as one would expect for an episode of, well, Supergirl. But it cannot be denied that the fun and whimsical nature of the crossover, originally set up in Part 1 over on The Flash, carried through to the end without shortchanging important emotional beats. While the stakes never felt as high as the previous three years, the shows made up for it with a few great reversals of expectations and callbacks to the larger DCTV universe. 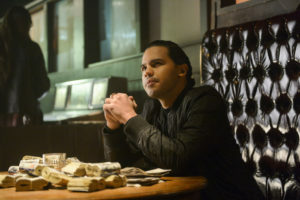 Jimmy (Mehcad Brooks), for example, got to be “Superman’s Worst Pal” while Cisco (Carlos Valdes) yet again established himself as the most useful guy in any universe regardless of his character alignment. The latter probably had the most fun with his alternate role, proving once more that Valdes is an actor capable of so much more than he’s allowed to do every week. Unfortunately, every Supergirl regular cast member outside of the two Danvers sisters only had one scene or so to make an impression. And some of them, like Lena and Nia, didn’t appear at all. A crossover can’t fit everyone in, that’s certainly true – but it’s a shame to introduce the world to the newest Lois Lane (guest star Bitsie Tulloch) and then not let her interact with other characters, such as fellow journalist and supposed friend James Olsen. Furthermore, Deegan taking on Superman’s form rather than Supergirl’s meant that Tyler Hoechlin got more to do for the majority of the hour than Benoist did. He performed admirably, clearly distinguishing between the innocent joy of Clark’s heroism and the self-centered greed of Deegan’s, but at times it felt more like a backdoor pilot for a future Superman show than it did the Supergirl hour of the crossover. His proposal to Lois was a beautiful scene, but it felt as out of place as the annual Barry and Oliver drinking scene did precisely because Kara was offscreen for both. And given that the first two hours were already an Oliver and Barry buddy-cop comedy with Kara as the (adorable) third wheel, that didn’t help the sense that the story was seriously slanted in favor of the men. The multiverse is depending on Oliver Queen. That being said, Kara did get a beautiful moment with Alex and once again cemented the sisters as the real love story of Supergirl. They’re connected in any version of the universe, much like Barry and Iris – which was heartwarming even if it didn’t necessarily make a larger impact on the narrative because this was Earth-1’s Alex and not Earth-38’s. Kara also showed her willingness to die for a world that isn’t even her own, when she and Barry chose to run around the world at Mach 7 to slow time down enough to steal back the Book of Destiny from Deegan. This was perhaps the only moment that felt a little abrupt, with Kara and Barry speeding off to what they assumed would be their deaths without a second thought. Oliver and Clark were left behind to try to save them, but the latter’s concern for his cousin was barely shown despite the focus on him throughout the episode. 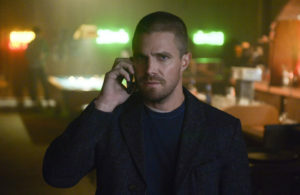 Instead “Elseworlds” took the time to set up next year’s Crisis on Infinite Earths by hinting at a deal Oliver made with the Monitor to save his friends’ lives and potentially destroy his own destiny in the process. Speaking of the Monitor, his modus operandi may have been the oddest part of the crossover. LaMonica Garrett played him with a quiet and fearful intensity, but his choice to hand off the book to a mad scientist who’s biggest goal was to be a heroic beefcake seriously undercut the dramatic potential of the story. As mentioned, the threat level never felt high enough and it made the Monitor look more petty than anything – which was very much at odds with his imposing presence and the doom he foretold. Nevertheless, “Elseworlds” was a run ride, especially for big fans of the Oliver and Barry bromance. I’m just hoping that next year they’ll do a better job of giving Kara a story arc as meaningful as the one they always give Oliver, and that characters like Iris, Lena, and Felicity are allowed to participate in the events the way they naturally would if they weren’t being held back by who gets a paycheck and who doesn’t.